We're the supplier that keeps you running with customized blasting, vibratory and parts washing consumables. 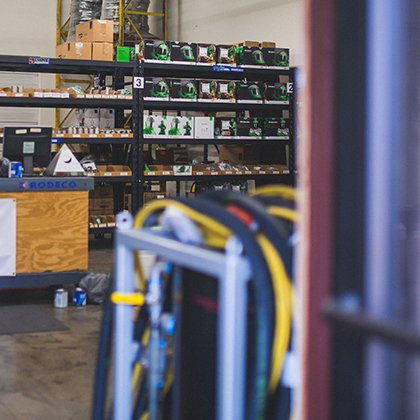 Our experts ensure that you get the exact right product for your needs—and we guarantee our customized supply solutions will keep your equipment and processes running. But we won't stop there... count on us to continuously provide you with the media you require. MANAGING YOUR INVENTORY FOR WHEN YOU NEED IT MOST. When you become a preferred partner with Rodeco, your stock is inventoried and held with us. And when you need more, we guarantee same-day shipping! PARTNER WITH RODECO AND NEVER WORRY AGAIN ABOUT RUNNING OUT OF SUPPLIES. TALK TO RODECO'S SUPPLY TEAM TODAY!Partner with us to stock your supplies with same-day delivery! Rodeco stocks helmets and suits, carbon monoxide filters and other safety equipment from RPB and others. The professionals at Rodeco Blast Solutions offer the best safety equipment to meet your needs, as well as consulting and training on how to keep your operators safe on the job. WE HAVE STOCKED SAFETY EQUIPMENTLearn more about our large inventory of supplies and safety equipment.